Is Your Business As Profitable As It Could Be? The Way Consumers Find Your Business Has Changed FOREVER! Marketing and Advertising has Evolved...Have You? In the past “Traditional” media helped your business grow...but, no more. Yellow Pages, Newspapers, TV, Radio & Magazines are all experiencing their biggest declines in history. Today, while Social Media, Mobile, Video, SEO & Internet Marketing are essential to being competitive in today’s marketplace….it's a "5-Star" Reputation that builds trust and motivates a customer to engage with you. searching for your company name and city reveals your company's reputation? Customer Reviews are a MAJOR factor in almost every type of 'online' marketing? 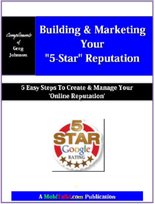 SEO...social media...pay-per-click...internet marketing...DOESN"T WORK ANYMORE if you have bad or few reviews online? Is Your 'Online Presence' The New Real Estate Investment? Will Mobile Phones Become The Family Office of Choice?